You buy something in a pharmacy in Dublin. The person at the counter puts it into a paper bag, with this image printed on one side. You look around: here in the present, the modern lines, the hygienic atmosphere, the concealment of every item inside packaging, the medicalizing approach to the body and the reams of instructions, warnings and disclaimers, all seem to be undercut by the bag’s nostalgia for an Old Curiosity Shop consumer experience. Not a pharmacy, nor a chemist, rather an apothecary. We all know the scene: musty bottles, glass-fronted oak cabinets, banks of identical drawers labeled with yellowing paper, weird specimens, pestles and mortars, crude surgical tools, cursive fonts. You go to France, where the pharmacy is a key component of every streetscape, even in the tiniest village. In its famously good healthcare system, the French state reaches into the life of every street in the form of the pharmacie, often located at a key crossroads, a place of social significance, marked by the simple, ancient symbol of the cross. This is the manifestation of what Foucault described as the biopolitical state. The state takes on the responsibility for the health of the nation and in the process disciplines its citizens, obliging them to live full and healthy lives. You are in the French countryside. You go into the woods. You pick some mushrooms. You’re unsure about how safe they are, so you ask around: who knows this stuff? The answer: the pharmacist, one of whose official functions is to identify wild mushrooms. And the apparent contrast between the modern medical pharmacy and the olde worlde magickery of the apothecary suddenly diminishes. This is the same institution, playing more or less the same role as that of folklore, folk medicine, superstition, religion and prayer. 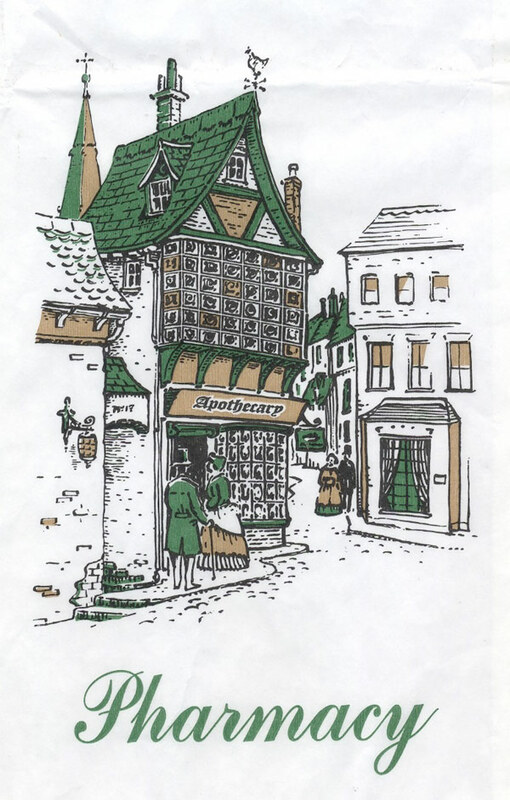 In fact, the apothecary’s shop is the beginning of the shift that took medicine out of its immediate locales, out of the forests, and out of the hands of the local quacks and witches and into the world of mass society, consumer experience, scientific knowledge and into the sanitized hands of the pharmacist and doctor. In the older system, there is an awareness that the danger and the cure for the danger came from the same place (i.e. the natural world, the forest floor, your own body). Poison and cure are two aspects of the same thing. In modern medicine, this paradox is captured in a discourse of ‘dosages’. The authority that went with the local healer transfers in the modern era into the hands of the beneficent state. But the old associations run deep. Here, at the foot of the Rue Mouffetard, one of Paris’s oldest streets, stands this modern pharmacy, like thousands of others across France. The slabs of marble that join at the corner are nicely done. Look again, though. The wolf of the old forests stares out at you.